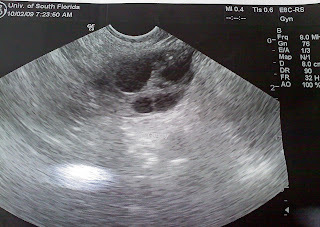 This is a picture of my right ovary I have 2 follies at 13mm and 2 follies at 11mm. I have 2 follies on my left side one 11mm and one at 8mm. I have been praying for 6 eggs all week. I know that is kind of silly but for some reason 6 has been in my head since they told us about this. He also said my lining is at 5.2mm which is over the 5mm they like to see and I have a good 3 layers of sticky (uterine lining). That is certainly not the medical term but in the IVF world we all know the sticky is so important. Well they also upped my meds from 150IU to 225IU. We will see how this makes me feel tonight. My next US is a 9am Sunday. What a great Sunday morning. I think I am going to nap and let these follies keep growing.